Home/Pet Care Centre/He may be a chocolate labrador but doesn’t mean he can eat it! He may be a chocolate labrador but doesn’t mean he can eat it! As Easter approaches you will no doubt see lots of stuff urging you to make sure your chocoholic Dog doesn’t get his snout into the Choccies! Dogs have amazing sense of smell and can sniff out a chocolate from quite a distance … all the way through the cardboard and wrapping, in fact! 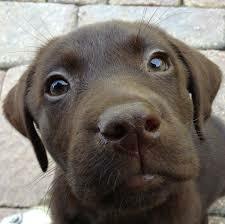 So whilst you know that chocolate is seriously bad for dogs, do you know why? What is toxic about chocolate? Chocolate contains caffeine and a chemical called theobromine. Theobromine found in chocolate is usually small enough to ensure it is safe for human consumption. But dogs metabolise theobromine much more slowly than humans, which means the toxin builds up more in their system. Is there such a thing as “safe” chocolate? Whilst the toxicity can vary with different types of chocolate – it’s best to ensure they are all kept out of your pooches way! Generally the more bitter the chocolate (or the higher percentage of cacao) the more caffeine and theobromine it is likely to contain. Whilst white chocolate contains less caffeine and theobromine than milk chocolate its still potentially toxic. Signs of chocolate toxicosis can begin to occur within an hour of ingestion but can take longer if the pet has a full stomach. Caffeine and theobromine are both stimulants of the brain and heart. The signs reflect this but even so can be difficult to pick up – signs can include hyperactivity, increased heart rate and muscle tremors. Usually, the first thing you would notice is vomiting, with diarrhea, lethargy, panting, anxiousness, restlessness, and seizures. This is not a watch and wait situation, as chocolate toxicoses can lead to death very quickly. So if you suspect your pooch has got his snout into the Easter Eggs get in touch with your vet right away. Try and gauge how much your pet may have eaten, and what type of chocolate as this info can help your vet work out how much of the toxins have been ingested and the likely degree of toxicity. Your vet may induce vomiting (don’t try to do this at home!). Your vet has the necessary means and equipment to ensure it is done safely, or depending on the timing, other actions may be taken such as administering a liquid that limits absorption of things in the stomach and upper intestines. Your pooch may also require an overnight stay which could include intravenous fluids to help flush out the chemicals, and of course general monitoring is also important. Is chocolate OK for cats? Definitely not! But luckily for us cats are not as attracted to chocolate as dogs are, as they cannot taste the sweetness. But don’t assume that they won’t give a chocolate mousse a good go, or other items containing cacao, and bear in mind that if a cat does eat chocolate it is more likely to be of a toxic proportion than for dogs. So the same applies, keep the chocolate out of kitty’s way, and take action quickly (get to the vet), should you suspect an ingestion of chocolate in any form.